The Marañón River — traditionally the villagers’ source of water for drinking, cooking, bathing, and washing clothes and dishes — flows by just a few meters away, but villagers haven’t trusted it since an oil spill in June 2014 sent oily sheens slithering down the Cuninico River, a tributary that borders the community. Two and a half years later, residents of Cuninico have no safe source of drinking water and no way to purify the river water, which still shows traces of oil after a heavy rain. Their chance to get a temporary water purification plant was squelched in early 2015, when a government commission declared the spill site clean, even though stirring the water around the pipeline released a string of oily bubbles with a strong smell of gasoline. 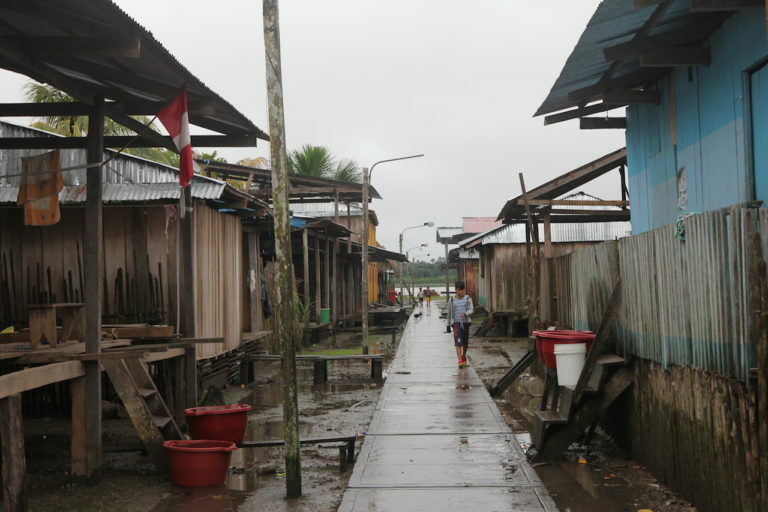 CUNINICO, Peru – Whenever there’s a cloudburst, the sidewalk that serves as the main thoroughfare in this small Kukama Indian village is lined with plastic buckets and basins to catch the rain that drips from tin or palm-thatch roofs. Two and a half years later, residents of Cuninico have no safe source of drinking water and no way to purify the river water, which still shows traces of oil after a heavy rain. Their chance to get a temporary water purification plant was squelched in early 2015, when a government commission declared the spill site clean, even though stirring the water around the pipeline released a string of oily bubbles with a strong smell of gasoline. Since then, the government’s environmental monitoring agency — which was among the agencies that gave the all-clear — has declared the site still contaminated, but the community still has received no treatment plant. “We don’t drink river water any more — it gives us diarrhea and stomachaches,” says Yadira Saldaña, who sells bread from her home. Buckets that collect rainwater, the only safe source of water for drinking and cooking since there was an oil spill in the Kukama indigenous village of Cuninico in 2014. Photo: Copyright © Barbara Fraser. When the pipeline that crosses the Cuninico River upstream leaked more than 2,300 barrels of oil in 2014, no one warned Cuninico’s residents not to drink the water or eat the fish. 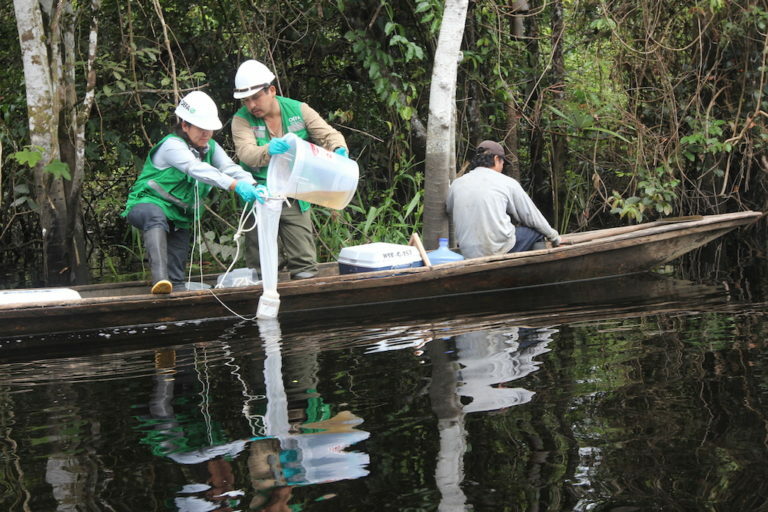 Petroperú officials insisted that the spill was contained in the canal that serves as the pipeline right-of-way and that the river water was safe to drink. At a meeting with community members a week after the spill, a Petroperú official said that an earthen dam between the canal and the river had kept the spill contained. When community president Galo Vásquez noted that oil had floated into the Cuninico via a natural stream that skirted the dam, the company official accused community members of having dug the stream deliberately. Over the next six months, Cuninico became a boom town, as Petroperú hired several hundred residents from that village and neighboring communities to clean up the spill. Workers earned the equivalent of about US$20 a day — nearly seven times the usual wage for day labor — and used the money to improve or expand their wood-frame houses, swap thatched roofs for tin, or buy new motors for their boats or televisions for their homes. 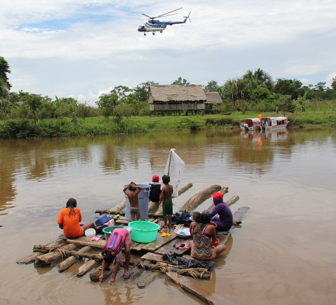 During those months, Petroperú provided rations of food and drinking water to each family and hired people to fetch water from the Marañón River, upstream from the confluence with the Cuninico, which families could use for bathing. The rainy season in this part of the Peruvian Amazon begins in earnest in November, and over the next six months, water levels in the Marañón rise by as much as 30 feet. By mid-December, the flooding had made further cleanup difficult, and Petroperú pulled its workers out of Cuninico in December, announcing that the cleanup was complete. But the rains continued, and about a week later, villagers saw oil sheens snaking down the Cuninico River and washing into the Marañón. A team of OEFA monitors extracts samples in one of the water sources of the community of Cuninico. Photo: Copyright © Barbara Fraser. 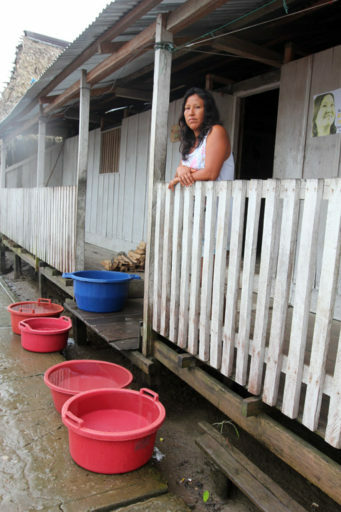 On January 19, 2015, Vásquez and the leader of a neighboring community asked the government to declare an environmental emergency, partly because of the pollution of Cuninico’s main water supply and partly because of fears that the fish on which half a dozen communities rely for sustenance and for income could be contaminated. A declaration of emergency would have cleared the way for Cuninico to receive one of more than 60 temporary water treatment plants that were being installed in early 2015 in villages affected by oil operations along the Marañón, Corrientes, Tigre, and Pastaza rivers. On February 26, technical staff members from eight government agencies — including the Environment Ministry, Environmental Evaluation and Oversight Agency (OEFA), Ministry of Energy and Mines, local and national water authorities, and the regulatory agency responsible for oversight of oil infrastructure — visited Cuninico to inspect the spill site. Early on the morning of February 28, 2015, villagers took a reporter to visit the same area seen by the government representatives. Seasonal flooding had raised the water level so much that the canoe easily skirted the earthen dam that, according to Petroperú officials, would keep any spill contained. Meanwhile in Cuninico the villagers must contrive homemade rainwater catchment systems to have access to clean water. Photo: Copyright © Barbara Fraser. Near the dam, sacks of oil-soaked rags, boots and gloves were awash over a half-submerged wooden platform where they had been abandoned when Petroperú left the site in December. Along the canal, containment booms that had once extended from one side of the canal to the other floated free in the flooded forest. And near the point where the rupture had been repaired, a boatman easily stirred oil to the surface of the water in the place where drums filled with spilled oil had been stored. Local residents said later that men from the community had been hired to dump a chemical dispersant into the pipeline canal several days before the commission’s visit. Boatmen said the inspectors had not asked to see the areas that were still contaminated. In an interview several weeks later, Luis Suárez, then supervisor of the pipeline for Petroperú, acknowledged that the rising water had forced the company to leave before the cleanup was complete, and that it would return later in the year to continue the effort. Workers eventually returned in September 2015 for two months. 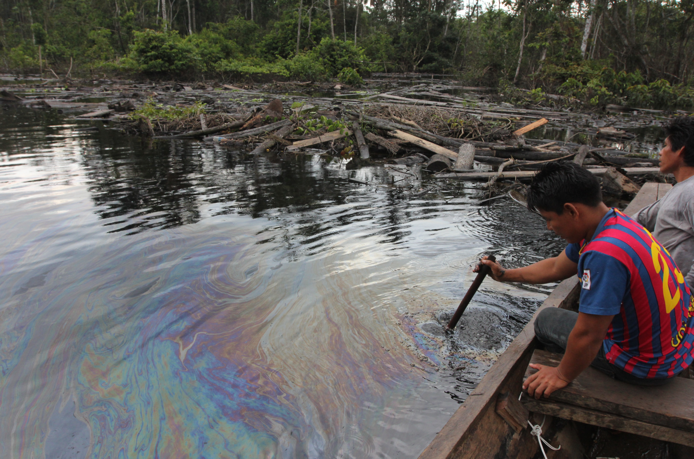 Women wash clothes and children bathe in the Cuninico River after the oil spill. Photo: Copyright © Barbara Fraser. The Environment Ministry report only mentions that the inspectors recommended that Petroperú remove some plastic tarps and plastic bottles discarded at the site, and that the Loreto regional government provide the residents of Cuninico with water purification kits. Those kits contain water purification tablets, which are ineffective against contamination from metals or chemicals, which could be removed by the filters in a portable plant. The Environment Ministry report closed the case and Cuninico lost the opportunity to be added to the list of communities that received the first shipment of portable water treatment plants. 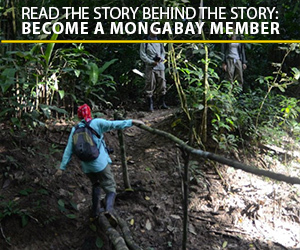 Later in 2015, government officials said Cuninico was slated to receive a plant, but the effort stalled because both the national government and the local district government had filed proposals for water systems for the community. Under rules meant to reduce corruption and poor investment in public works, duplicate applications are not allowed. That impasse could be solved soon. During recent negotiations to end an indigenous protest against oil pollution in the Loreto Region, Peruvian Minister of Production Bruno Giuffra promised prompt attention to the need for clean water in communities affected by oil spills, including Cuninico. Two and a half years after the oil spill, water remains the community’s most critical problem, Vásquez says. When the rains slack off in June, families often cannot collect enough rainwater to last from one storm to the next. When the hoarded supply runs out, they reluctantly draw water from the rivers — and keep looking to the heavens. Villager from Cuninico stirs up oily residue in the pipeline canal two days after a visit by inspectors who declared the cleanup of the oil spill complete. Photo: Copyright © Barbara Fraser.